Could be. Appleseed calls that "letting the perfect be the enemy of the good." 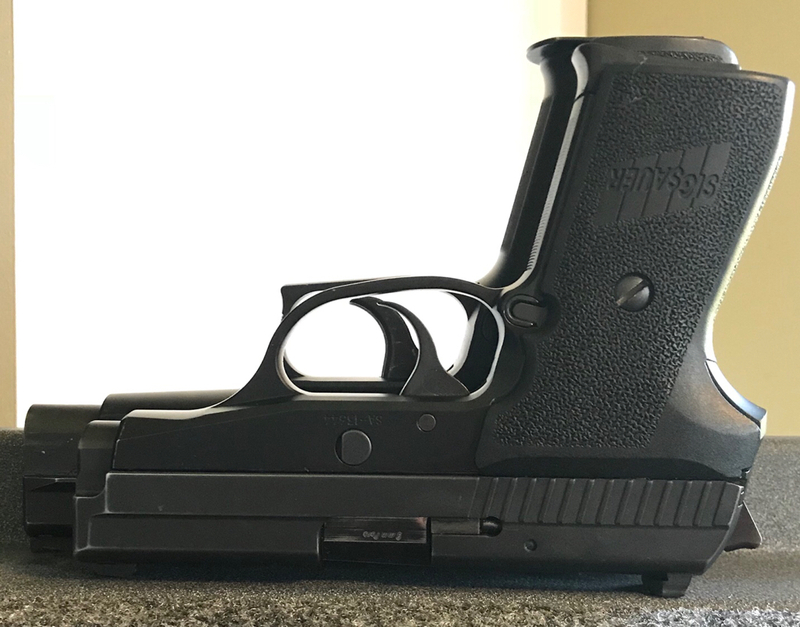 Size reference against a P226. The pistols are lined up against the rearward most portion of the frame ‘bump’. While it doesn’t look like much of a difference in thickness, it’s actually pretty dramatic in the hands. It fits in 226 holsters surprisingly well (at least JMC kydex), but I’d still like to get a dedicated holster made for it. While there doesn’t seem to be a large difference between the 239 and 226 on paper, the 239 is stupendously easy to conceal with next to no effort, where some conscious thought needs to go into setting up the 226 for success. Took it to the range yesterday and was pleasantly shocked to confirm the ‘Little gun shoots like a big gun’ description that’s been given to me before. Downside is model specific fat trigger and the cost of magazines. I’d highly recommend it. This is the pistol I mentioned purchasing in the 48 hours thread. Regarding fit and finish my one area of concern is the barrel. The grooves have what I would describe as chatter marks from the rifling machine. Does not seem to affect function but they sure collect crud. The cleaning instructions recommend using light grease on the rails and a few other spots. I didn't read the manual and used Triflow very lightly. In reading posts on the SCCY forum one common complaint is the pistols starting to not fully chamber rounds after a couple boxes of ammo have been fired. I did not experience this during my shooting and I'm wondering it the Triflow vs grease may have helped. After the range session this was one of the dirtiest pistols I've ever cleaned, any I regularly shoot black powder revolvers. Maybe the grease gums up with powder residue easier than Triflow. At this point I'm sticking with Triflow. I've been working 3rd shift this week so when the mail carrier delivered the holster and mag loader I'd ordered for my new CPX-2 I decided to head to the range for a function test. I shot a box of Remington, Herters, Federal, Winchester and Armscor ammo, all 115 gn FMJ. Temp was 6 deg. F, overcast sky, light breeze in my face. Targets were 6" paper plates at 12 yards. I had no malfunctions of any sort today with the pistol or ammo. Point of impact was slightly different with each brand but everything stayed somewhere within the 6" paper plate, which is my criteria for a carry pistol/ammo combination. Federal was the worst for me, I had to work to keep 5" groups. They were centered, just open. Herters was also disappointing, a centered 4" group but 3" low. The Winchester function fine and had acceptable groupings, but I'll not buy it again. I didn't read the box and it is steel cased. Actually I was a little surprised it functioned so well given the steel case. The Remington and Armscor ammo both shot pretty much to point of aim and gave 3"-3.5" groups consistently. Before the trip home I reloaded both magazines with the Armscor given the occasional hard primer reports I've heard about the Remington but I'd have no hesitation using the Remington ammo for practice. The mag loader is a RangeTray brand and made loading the mags much easier and the mags did seem to become easier to load with use. Before I went to the range I disassembled and cleaned the pistol placing a drop of Triflow on each rail and two drops on the barrel. The holster is A Barsony Leather brand and I'm not so sure about it. workmanship is OK but th epistol rides a little high and I may have to modify it slightly around the trigger guard. I wore the pistol all afternoon and found it very comfortable to carry. I realize 12 yards and 6" targets is not much of a range test but I consider it sufficient for my purposes. I've very happy to have no malfunctions with 5 brands of cheap range ammo and the compactness makes the pistol easy to carry. I'll pick up some hollow points for my next trip and let you know the results. Acquired used, with an unknown number of rounds fired prior to my acquiring it. I finally had the opportunity this week to hit the range with my newest acquisition, an unshaved cylinder .455 Webley Mark VI revolver. Loading this revolver is a delight. What a machine! What metal! 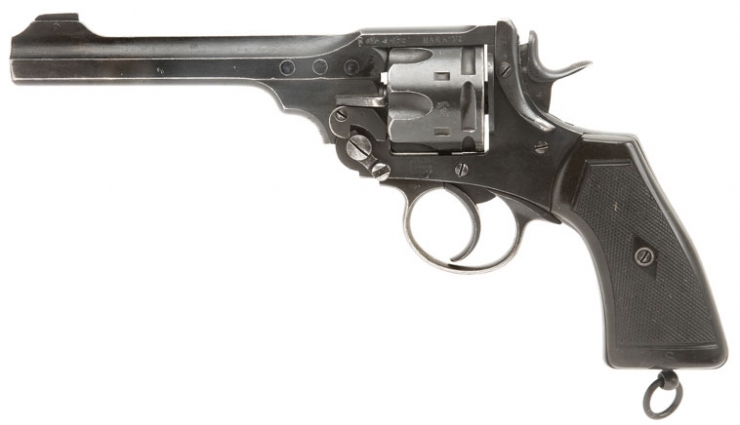 It's a double-action revolver with a 6-round capacity and a top-break loading. It has an auto-ejector that brings out the cartridges quite nicely. The .455 Webley round has a thin rim that makes this feature helpful. The top-break lever is well-placed so that one's right thumb is perfectly positioned to activate it. The six rounds seated for me probably as well as the first day it went into service. I first put the target out around 20 feet. This thing has an amazingly-long trigger pull. Someday I'd like to get it measured. It's easily the heaviest trigger that I own. The trigger does pull all the way back, allowing you to pinch your finger between the trigger and the guard if you're not careful. In DA shooting, I tended to shoot a bit high and to the right, with a poor grouping. Still, I hit the target! In SA shooting, I had a much-tighter grouping but was still just a bit too high and to the right. This was consistent through the three groups of six rounds I sent downrange. I have since read some articles/posts that seemed to indicate that I was shooting too near, which might explain why I was hitting higher than where I was aiming. Overall, it was a delight to shoot. I'll need both some more ammo and the equipment for reloading. I'm hoping to take it outdoors next week. When you reload for it, try some lighter bullet weights. That may fix the elevation issue. I owned Mark VI's a couple times, they were reconfigured for .45 acp, as you describe. Both always shot low with 230 grain ammo. Also, keep your reloads to the mildish end of the spectrum, these guns aren't as strong as solid frame revolvers.